As a child, Geert Hüsstege liked to paint portraits and landscapes. Twenty-five years ago, at the invitation of an Orthodox priest named Father Chrysostomos, Hüsstege learned to paint icons at the Abbey de Postel, a Norbertine monastery in Flanders. Later, Hüsstege paid a visit to Father Chrysostomos in Vienna, where the pastor encouraged him to continue his painting and to consider becoming a teacher of icon painting himself. No sooner said than done. He followed the priest’s advice and soon thereafter realized his first exposition, first class and first commission. In an interview with Eikonikon, Geert, now a celebrated iconographer in the Netherlands, looks back on his exploration of icons. When did your adventures with icons begin? “Isn’t that something for you, Geert?” It’s been 25 years since I was a guest at the Abbey Tongerlo (near Antwerp, Belgium) and was asked that question: “Father Chrysostomos is teaching a course in icon-painting, would you like to join?” Since childhood, I have been painting landscapes and portraits, including those of Jesus and Mary. And thereby, keeping a family tradition alive; my great-grandfather was a church painter who came to the Netherlands from Germany. Not long after considering that question, I sat down with Chrysostom, a Groninger at heart, and there on the table lay the first whitewashed panel ready for me. (Fig. 1) Wholeheartedly, he handed me a brush and told me I could start. Step-by-step I discovered how an icon is painted and a whole new world opened up to me! If you made an error, you had to rinse it off and begin again. 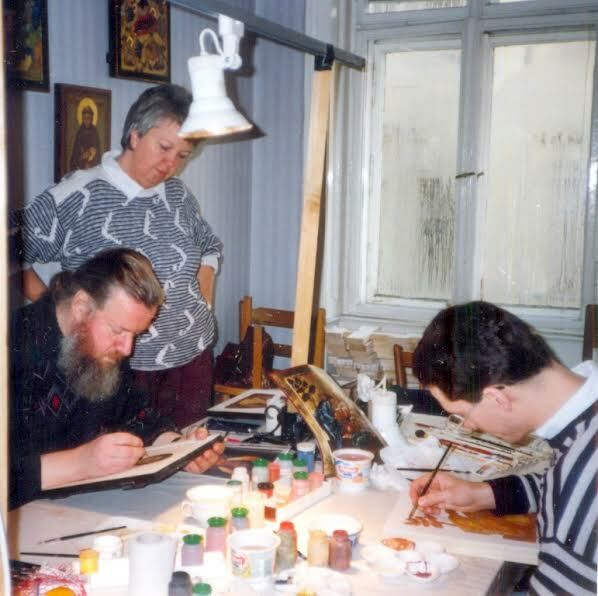 In the subsequent years, he initiated me into the sacred art of icon-painting and the corresponding spiritual experience. “In this you must delve more deeply,” he impressed on me during one of his classes in Vienna. This actually started my search for the true Nature of God. It was a time of intense searching, questioning and discovering this ‘Mystery’, with icons acting as mediators on the path. When did you first exhibit? And when did you start teaching? With Father Chrysotomos’ blessing I returned home and continued to work though I realized it was unnerving to be on your own. Not long after an acquaintance organised my first icon exhibition in a small gallery in Ulvenhout (the Netherlands). My parents arranged an atelier for me under the stairway and they were helpful in setting up the expositions. 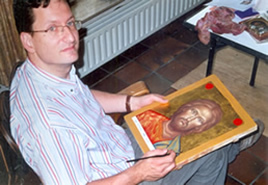 There was an interest in icon painting developing and in this way I began the first 10-day class at the Emmaus Monastery in Helvoirt (Brabant, Holland). I was already friends with Father Piet Al and it was a special honor that he wanted to consecrate the icons. As he proceeded with the liturgy, the church filled with music in Ukrainian: it was a wonder to behold. Especially when he lifted the icons and blessed us with them; this memory still moves me. He returned the icons to everyone and in gratitude, we kissed them. Piet enthusiastically provided fascinating lectures on the history and significance of icons. The last commission from him was a large icon of John the Baptist for his abbey in Heeswijk-Dinther. His face lit up when the icon was solemnly installed accompanied by beautiful Byzantine chants. Rublev’s ‘Holy Trinity’ icon is of great significance for many people. What place does this icon hold in your life? In 1998, through the Tilburg Byzantine Choir, I had an opportunity to participate in an exchange programme with Father Ambrosius in Kolomna (Russia). As an icon-painter, I was allowed to sit behind the iconostasis. Here I observed the first ‘real’ Easter celebration; everyone greeted each other with great enthusiasm declaring, “Christ is risen, He is truly risen!”. Later, I visited the Tretyakov Museum in Moscow, which was not far from there, and spent all my time immersed in Rublev’s ‘Holy Trinity’ icon. The colors and the many layers of paint create a radiance in the faces which is incredibly beautiful! No reproduction in any of the books I have seen can capture this effect. When I returned, I made a plan to paint this icon and discovered that 2000 was the year dedicated to the Father, the Son and the Holy Spirit. For more than two years I devoted myself to this icon which leads us to the mystery of the Holy Trinity, the heart of our faith. Archimandrite Father Johan Meijer of the Community of St John of Damascus consecrated the icon. Now this icon is included in exhibitions and some visitors even venerate it with a deep bow of respect. What importance does the ‘Holy Mandylion’ icon carry for you, Geert? That same jubilee year, 2000, my wife and I met and how could it have been other way then through icons. Angelique has also been painting since her teens and I invited her to join a course. In the class we painted the Mandylion icon – the image of Christ’s face on cloth – and we were both so intently focused, that time had no meaning. From then on we were together, both on the road and receiving people in our workshop atelier. We moved from Haarendael to Heeswijk Dinther and then to an old farmhouse in Leimuiden. Meanwhile, we were blessed with four children who grew up in the world of icons. How did the ‘Holy Countenance’ inspire you again in 2009? In 2009, a month before the festivities for Easter, I again began a painting of the ‘Holy Countenance’. I had made a drawing on a photograph of the ‘Shroud of Turin’, one of the oldest ‘icons’ of Christ’s image, and my icon grew out of this. In this way, our own true, ‘Holy Countenance’ icon was born. (Fig 6) This icon is a reminder that God has a ‘face’ and it fulfills the desire we have of seeing it. God becomes one of us! Around this icon, we organized the exhibition,The Mystery of Christ that sums up his life and reflects his true ‘Nature’. Twenty-five years ago I asked myself if icon-painting was something for me. Absolutely, and much more, it’s Him, Christ. For the Orthodox faithful, every icon is a miracle and so is our own life with icons, each day is a miracle!